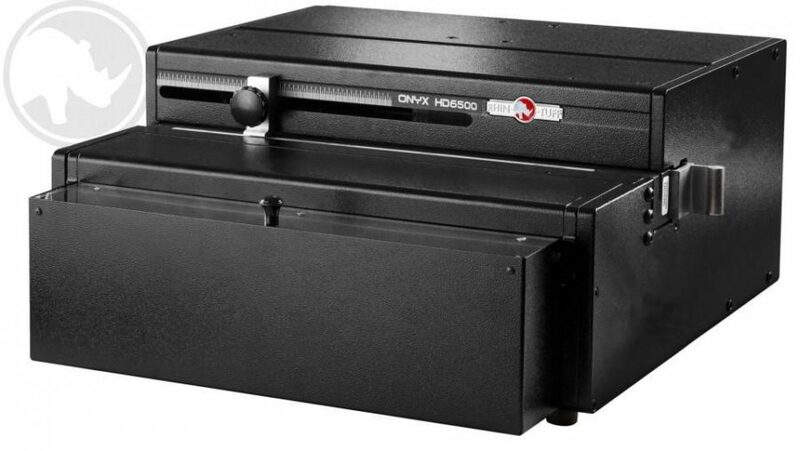 The HD-6500 is a 14 inch (356 mm) open-ended punch that features a two bolt die system for changing punch patterns in two minutes or less. The HD 6500 was designed for the customer who may change dies less often. It also offers quick, easy set-up: easy pin pulls and pre-set paper stop positions. The HD #6500 Paper Punch is a Best Seller; Powerful, Heavy Duty, Made to Take a Pounding and keep on punching your sheets. It is Very Easy to use and will speed your Punch and Binding production. With 3 year’s warranty on the machine and 1 year on the dies this is truly the most economical heavy duty punch available. Why consider any other punch when you can have the best for less? Punching capacity depends on the punch pattern being used. Rated at 25 to 40 sheets or up to 80 pages of 20 pound bond paper (80 gsm). (15,000 – 18,000 sheets/hour). Patented Auto Reverse Feature. Our New Overload Detection Feature Triggers an Auto-Reversing Function to Reduce Jamming in the Punch. Easy, “Paper to Pin”, Sight Alignment, for Balanced Hole to Edge Margins on Odd-Sized Applications.